Mission: The Grand Rapids Art Museum (GRAM) celebrates 100 years of art, legacy and vision with its Centennial Year in 2010. The mission of the Grand Rapids Art Museum is to provide a gathering place where people of all ages and backgrounds can enrich their lives through interaction with works of art in a thought-provoking and creative way. 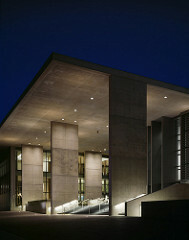 Established in the heart of downtown Grand Rapids, the new art museum is internationally known for its distinguished design and LEED Gold certified status. Established in 1910 as the Grand Rapids Art Association, GRAM has grown to include more than 5,000 works of art, including American and European 19th and 20th century painting and sculpture and over 3,000 works on paper. Embracing the city’s legacy as a leading center of design and manufacturing, GRAM has a growing collection in the area of design and modern craft.